Jordan Brand will have their share of goodwill as they promote the fight against Cancer with a special collection of shoes featured this month and February. 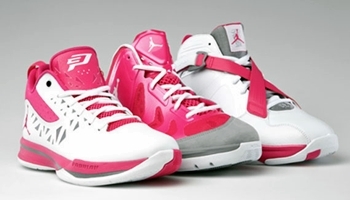 Called the “Coaches vs. Cancer” collection, Jordan Brand will be releasing special editions of the Jordan CP3.V, Air Jordan 8.0, and the Jordan Play in These II, which will all come out in pink colourways. Expect several NBA and collegiate basketball stars to wear this before it hits the market soon!